Specially designed for weathering all types of areas of railroad depots and maintenance areas, water or coal depots, diesel or steam locomotive maintenance areas, or for tracks in maneuvering zones, with a lot of use or even abandoned in industrial areas. You can make rust effects, old metal effects, dirt in general and many other effects usually seen in railway stations. You can also use these colors to age rolling stock and locomotives, as well as engines or other vehicles or cranes. This is a basic color collection for all railway and industrial area enthusiasts. 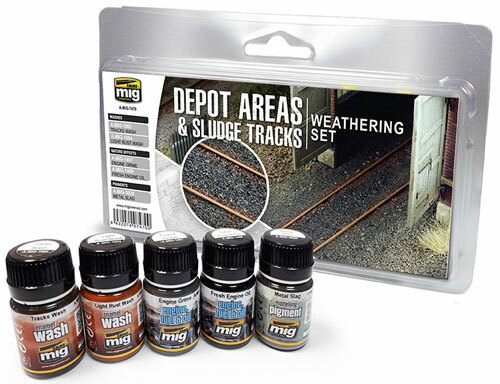 Copy this Depot Areas - Sludge Tracks Weathering to your MY ACCESSORIES roster.